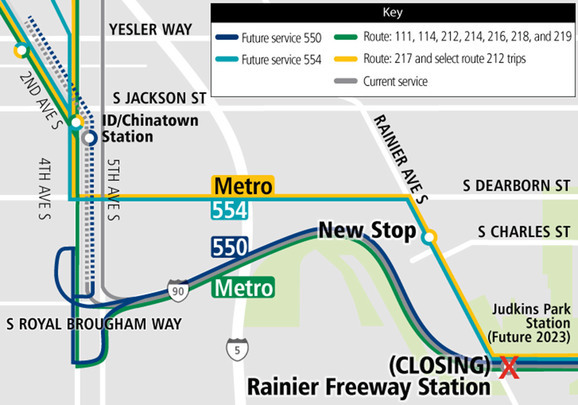 Rainier Freeway Station closure and I-90 bus changes coming Sept. 22! As part of East Link light rail construction, the Rainier Freeway station at I-90 will close beginning on Sept. 22, 2018. It will reopen as Judkins Park Link Station in 2023. Most bus routes that currently serve the Rainier Freeway Station will bypass the area, but Routes 554, 217, and select Route 212 trips will serve new stops on Rainier Avenue South. Metro and Sound Transit will invest in lane and signal improvements to help with bus traffic flow. Frequency will decrease slightly and trip times will be adjusted to maintain on time performance. A map of current and future service changes coming Sept. 22. Plan ahead and learn more about these changes at our online open house at I90servicechanges.participate.online. You can also keep up to date on the latest changes by joining our Service Planning, route 550, or route 554 email lists at soundtransit.org/subscribe.